The other day I looked up and I realized that I have been living in Cape Verde for more than three months now. I cannot exactly say that time has flown by, especially when I consider the nine weeks hard time in Pre-Service Training. At times those minutes felt like hours. Even now, as I settle into my new home on the island of São Vicente, I would have to say that the last three months has felt like… well… three months. The only thing that really shocks me is the thought that I have been here in Cape Verde for a longer period of time than I spent in South Africa last summer. It isn't a question of how fast or slow the time has passed. Instead, I find myself comparing everything I did in South Africa with everything I have done so far here, and honestly, there is no comparison. 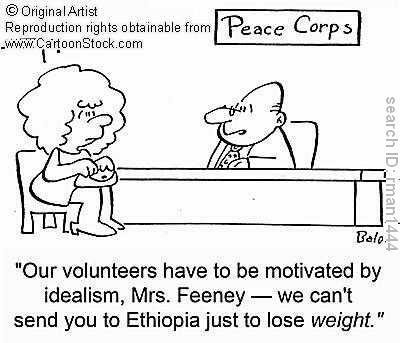 The good news is: that puts me right on track with the Peace Corps' expectations of a new Volunteer. Let me explain. 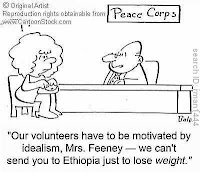 Much of the Peace Corps approach to development work grows out of a process known as PACA—that is, Participatory Analysis for Community Action. I'll skip the seminar and settle for giving you a snapshot of what this actually means. Basically, instead of showing up as an “expert”—presumably fresh off the boat from a faraway land and culture—and prescribing remedies for the development of a given community, PACA is a strategy for immersion and research, with the goal of eventually being in a position to actually help. The key word is “eventually.” For example, before you pitch an idea to a community leader about building a cool new community center, you might spend a few weeks compiling a “seasonal calendar” or a “daily calendar” that would help you to understand the patterns of life of different people or groups within that community. Why is that so important? Well, it would help you figure out when the best time to schedule a planning meeting would be. Or, who might actually use the community center, and when might they use it. The good thing about PACA is that it works. The tough thing is that so many of us volunteer-types want to jump right in and get our hands dirty. We want to feel like we are actually making a difference and changing the world (wait, did I say that out loud?). But when you combine the training phase with the emphasis on easing into our actual assignments, you are left with three months that feel worthwhile, yet not exactly game-changing. Sure, I got to roll up my sleeves a little during my first three months here, but only in the last week or so have I really started cooking. In the literal sense, I have been helping to teach a culinary class, and after two weeks of theory in the classroom we took our first trip to the kitchen. The lead instructor of the class is the General Manager of Ponte d'Agua, one of the classier establishments in our city. This week's visit to their kitchen—where the practical sessions will be held—brought me back in time to my first “real job” at the Burlingame Country Club. Now you know your boy can burn, but I am hardly qualified to train fifteen students who are looking to land a actual job in a professional kitchen. Instead, my role as a an instructor is to address elements of professionalism and entrepreneurship to add value to the training. My work experience in the industry is just a plus. Things are also heating up in terms of my other responsibilities at work. This week, Rory and I started teaching an English class for the staff and volunteer leaders of the Centro da Juventude. We also just submitted plans for two more classes that we will start teaching in November: Aula de Profissionalismo and Aula de Microsoft Excel. Feeling productive is not just about doing development work and changing the world. Sometimes it’s just a question of feeling like you're living right. For some it may mean going to church, for others it means spending quality time with the kids. In my life there has always been a correlation between living right and cooking. If I haven't cooked a meal for a week then I know there is something wrong. In other words, something (psychological or situational?) is stopping me from making time for the right things in my life. Fortunately, as the title of this post suggest, the kitchen is officially open. Rory and I have been piecing it together over the last four weeks—a cutting board here, a can opener there. We've sourced our favorite spices (or at least the ones that are available), and now we know who’s got if for cheap. But last week I knew the final piece had fallen into place when I got a phone call from DHL* saying a package had arrived for me… MY KNIVES! Thank you Big Brother Jaime-san for making that happen, and I hope they served you well over the last two years. We wasted no time getting to work in the kitchen at home. We recently hosted “family dinner” for the seven Peace Corps Volunteers that live on this island. We’ve also knocked out some tasty spaghetti (a little too often), sweet curry chicken with sautéed greens, rosemary pork chops with mashed potatoes, spicy popcorn chicken, sweet and sour chicken, sweet and sour pork, and fried rice. If you are wondering about the last three dishes, the answer is yes: there are plenty of Chinese people in Cape Verde. But they just can’t burn like the Chinese people back home in the States, so we decided to take matters into our own hands. *If you are sending me a care package (you are, aren't you?)... DO NOT USE DHL!!! It is stupid expensive. I recommend International Flat Rate Shipping from the good 'ol USPS. Also, do not declare some ridiculous inflated value, because I will have to pay customs on my end. Andrew you are a rockstar! And no I still can't call you Drew because you've always been Andrew to me ;-) I completely agree with your feelings on cooking. Now that I've been cooking loads, I'm starting to really feel I'm "home".. PS I'm SO jealous you're giving lessons though! Just imagine your little 5' friend trying to cook over those hot stoves in a tiny classroom (with 20 stoves) in a humid London summer with no A/C..Haha brutal.. Your food is lookin' good! And those knives are amazing. I don't blame you for having them shipped.